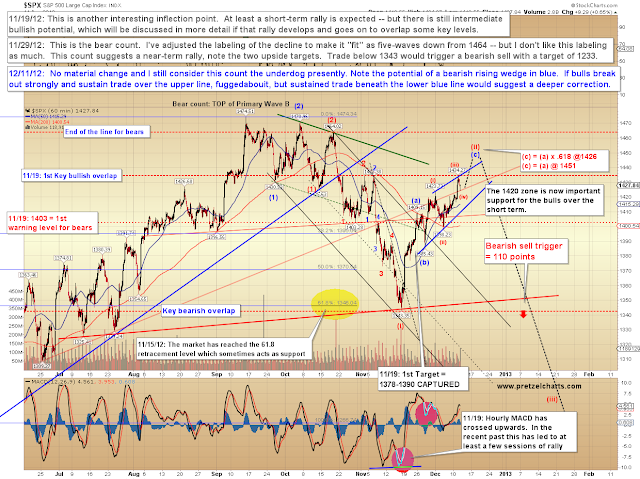 Last update (Friday) noted that trade above 1416 would suggest a first target of 1422 and a second target of 1433. 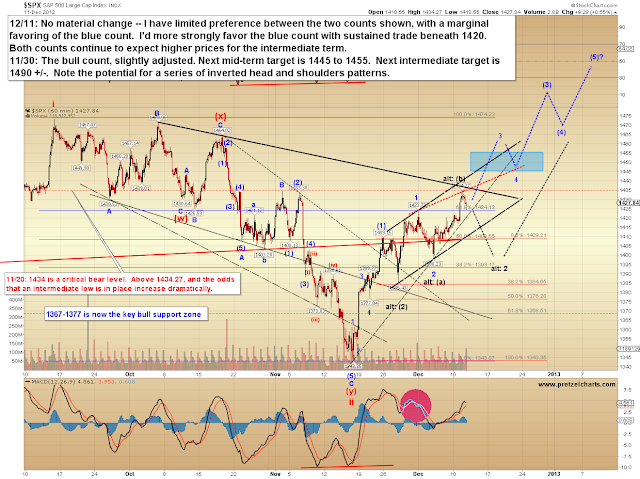 Both targets have since been reached, amounting to 17 points of profit. Of note, the S&P 500 (SPX) exactly tagged (to the penny), and reversed from, my "critical bear level" of 1434.27. It remains to be seen if bulls can sustain trade above that zone. I am continuing to give the edge to the bulls for the intermediate term, but the SPX has reached/is reaching another interesting potential inflection point. 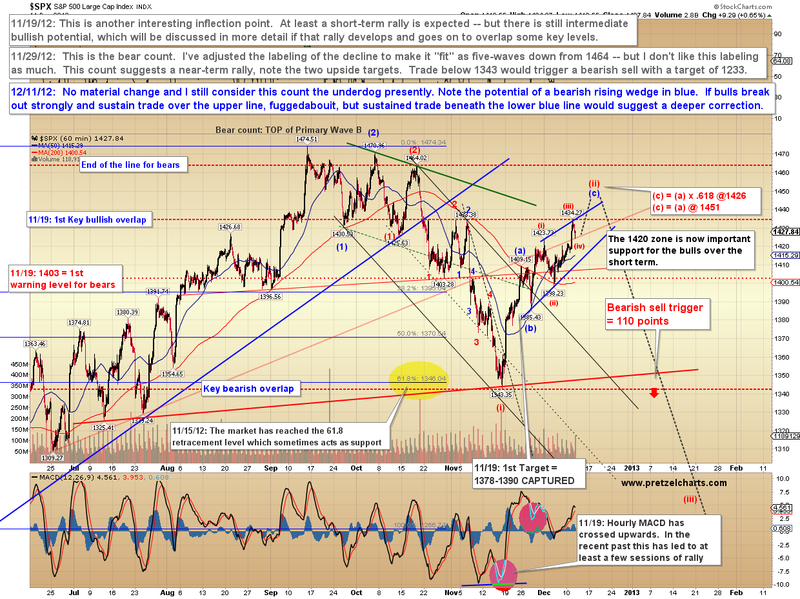 Since November 29, my standing target for SPX has been 1445-1455, and we've come within 11 points so far. This is a zone bears may attempt to defend, so longs should stay nimble going forward. Beneath us, I would watch the 1420 area as the first important support zone, and sustained trade beneath that zone would serve as a warning to bulls, at least over the short-term -- with the possibility of a more bearish intermediate outcome. Until then, as long as bulls maintain that support zone, the market is cleared to keep moving higher. The next two charts help outline the importance of this inflection point, and the outcome here will help define the bigger picture. According to Elliott Wave Theory, the market moves in three-waves when it's moving opposite to the direction of the next larger trend (correcting), and in five-waves when it's moving with the larger trend. I'm continuing to favor the bulls for the intermediate-term, because the decline from 1474 counts better as a three-wave move, which suggests it was a counter-trend correction to the long-term uptrend -- but it's still not a clear-cut picture, and thus both possibilities remain valid. The first chart is the bullish count, though it's important to keep in mind that there are different paths the market can take to reach these targets -- and very few markets move in a straight line. I try to adjust the projected paths when possible and as needed. PLEASE BE AWARE OF THE TYPO ON THIS CHART, WHICH SHOULD READ: "I'd more strongly favor the BLACK count with sustained trade beneath 1420." 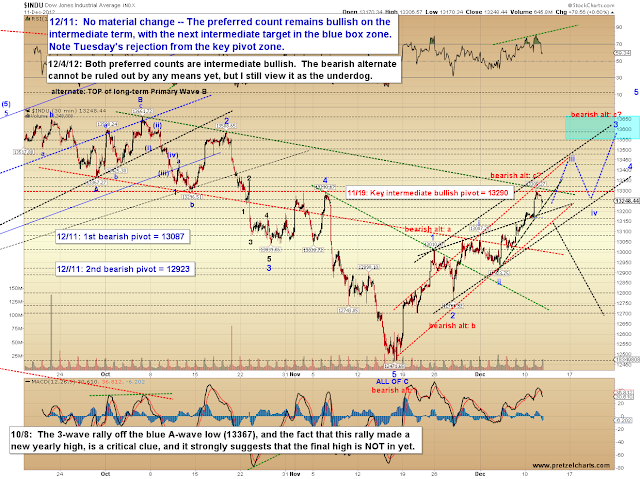 The next chart shows the hourly count when viewed through a bearish lens. The bears want this to be a three-wave rally (an ABC), which would make it a correction to the prior decline. Bears will need to make a stand soon to maintain their hopes, and the market has almost reached the zone where a corrective rally could expect to be rejected. 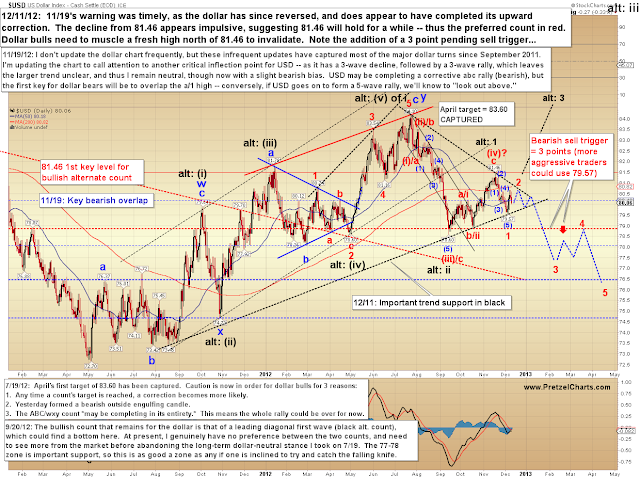 The chart below depicts an ending diagonal (c) wave. A related option, not shown on the bull chart above, is that of a leading diagonal first wave, which would play similarly over the short-term. 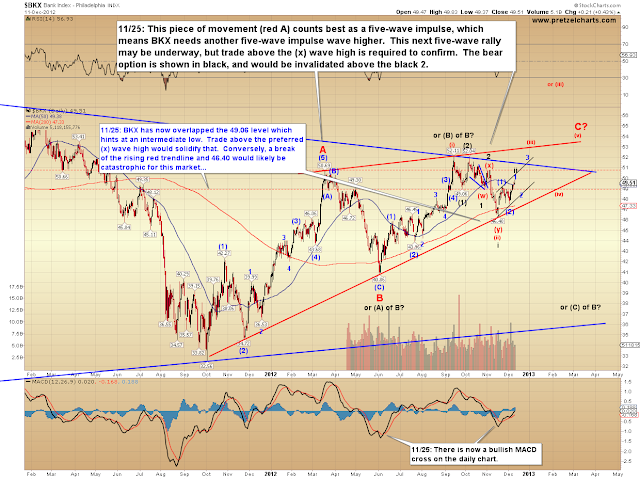 A leading diagonal or ending diagonal would make one more quick thrust up before a strong reversal toward 1385-1400. The difference between the two is that the leading diagonal would still be intermediate bullish, and march higher after that decline. Thus, we should watch the 1440-1455 zone carefully for any signs of reversal -- the chart below notes some signals to keep an eye on. 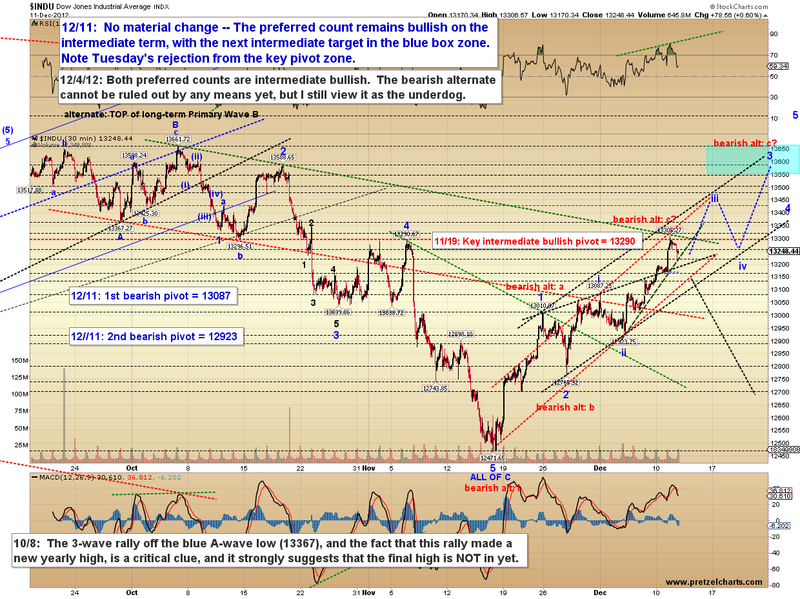 Those are the caveats for bulls regarding the current price zone. The caveats for bears are different. One problem for bears, as I see it, is that once the market sustains trade above 1434, we're back into a thinly-traded range (between 1434 and 1464), and there may not be much in the way of resistance until the upper edge of that range. 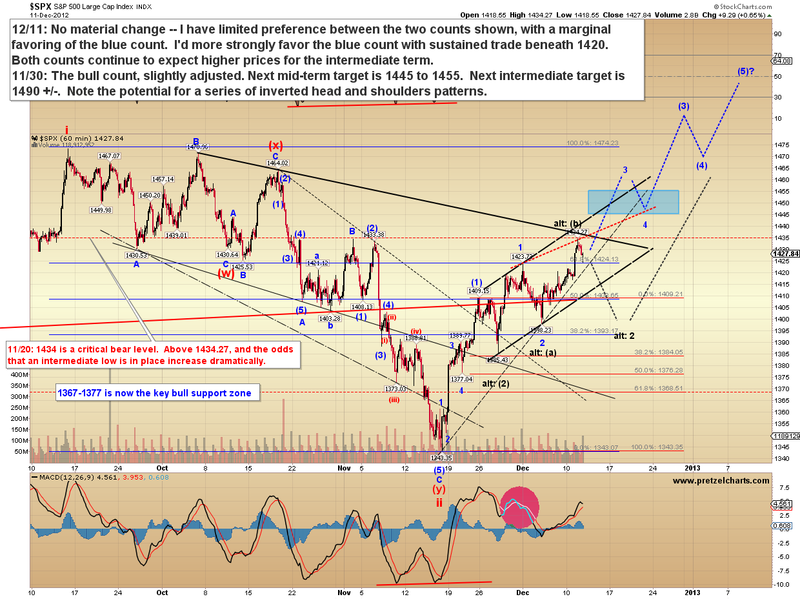 This would jive with the bullish interpretation of a third wave higher (blue (3)) underway. Third waves are pure trending waves, and are unforgiving of traders who cling stubbornly to wrong-sided positions. Looking down the road a bit: If the market can get through the congestion zone, then we reach the old resistance zone from 1464-1474. The market was rejected from that zone on three prior occasions. There's an old trading adage that says, "The more often resistance (or support) is tested, the stronger it becomes." My belief is the exact opposite: "The more often resistance (or support) is tested, the weaker it becomes." The logic behind my statement is that with every trip into resistance, more selling is exhausted. With every trip to support, more buying is exhausted. Eventually, the market chews through all the sellers or buyers in a given zone, and then simply breaks through and runs. Next up, I want to revisit the Philadelphia Bank Index (BKX), which I still believe depicts a five-wave rally from the October 2011 low, suggesting that at least one more five-wave rally to new highs is still needed. This is the daily chart, which takes a broad-based look -- but the hourly suggests the dollar may make another short-term run higher (toward red 2) before selling off again. In conclusion, fortunately my intermediate interpretation of the past couple weeks has now been proven correct, as both the bullish and bearish intermediate counts have been pointing to higher prices -- but the market's now reaching an intermediate inflection point. There are two ways we could see a correction (or worse) develop soon (the abc bear count, and the leading diagonal bull count) -- however, the possibility of a third wave that simply marches relentlessly higher should keep bears on their toes. Thus, the bottom line message for traders (on either side) right now is "stay nimble." Speaking personally, I'm still positioned net long from mid-November, but I'm now keeping those positions on a very tight leash. I approach inflection points such as this one on auto-pilot, so to speak. Take the emotion out of it -- know the important price levels and set clear stops for your trades. If the trade goes against you, or if the market dictates that it's time to take profits, then get out and live to fight another day. Trade safe.